Target locals and visitors to the Glens Falls region who are searching for everything there is to do in both the thriving downtown area of Glens Falls as well as surrounding communities. This smaller, niche audience currently views the site over 700,000 times per year. Do you market to locals and visitors of Glens Falls, South Glens Falls, Hudson Falls, Queensbury or elsewhere within the Glens Falls Region? You need visibility on GlensFallsRegion.com, a trusted area resource, backed by a talented team of tourism and marketing specialists who consistently strive to increase the websites reach and target an ideal audience with things to do and places to go. Create a custom, results-oriented marketing campaign for your business. Develop your own micro-site within an established and trusted resource. Receive detailed reports tracking your campaign; easily analyze the return on your marketing investment. Discover one of the most cost effective ways to reach a wider audience. 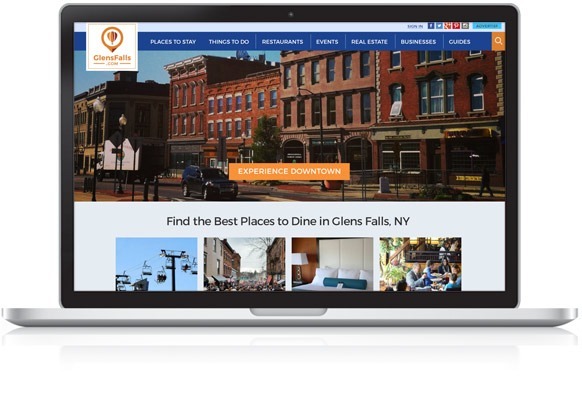 Advertising and marketing your business with GlensFalls.com can be a surprisingly affordable, yet highly successful solution in your marketing mix.